On paper, the down-spec S is the least desirable of the three Street Triples – but don’t be fooled into thinking what you want is what you need. Sometimes less is more and, with the Street Triple S, it’s less money and more fun. 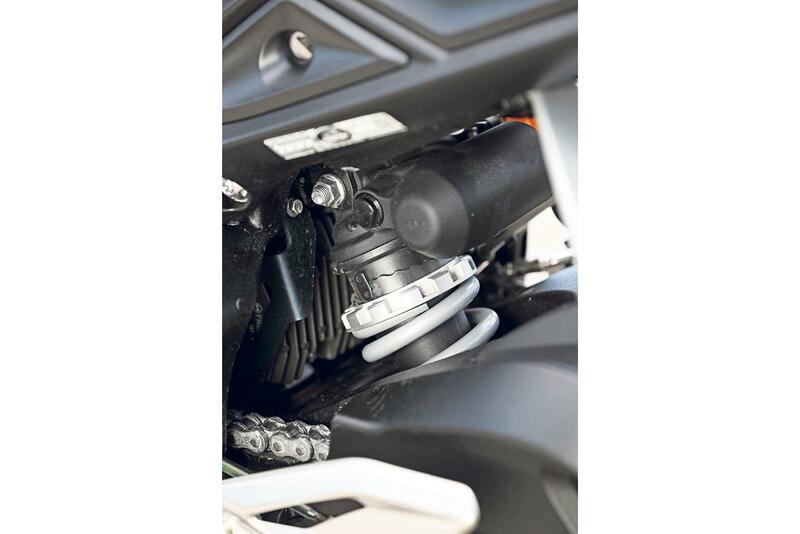 The super-smooth fuelling is let down by savage traction control. There’s an option to turn it off, but the intervention in Road mode (the other option is Rain) is intrusive; even just pulling lustily away from traffic lights can have the motor dropping dead momentarily – long enough for you to think there’s something actually wrong. The seat height on the S is lower than on the RS, thanks to shorter travel suspension. Apart from fitting more people more of the time (it doesn’t change the roomy, comfy, nicely sporty riding position), it also means the S sits closer to the road and feels like it’s being sucked into the tarmac – and there’s nothing low-spec about the Pirelli Diablo Rosso Corsa tyres either; they grip like slicks compared to the dubious rubber attached to some of its rivals. 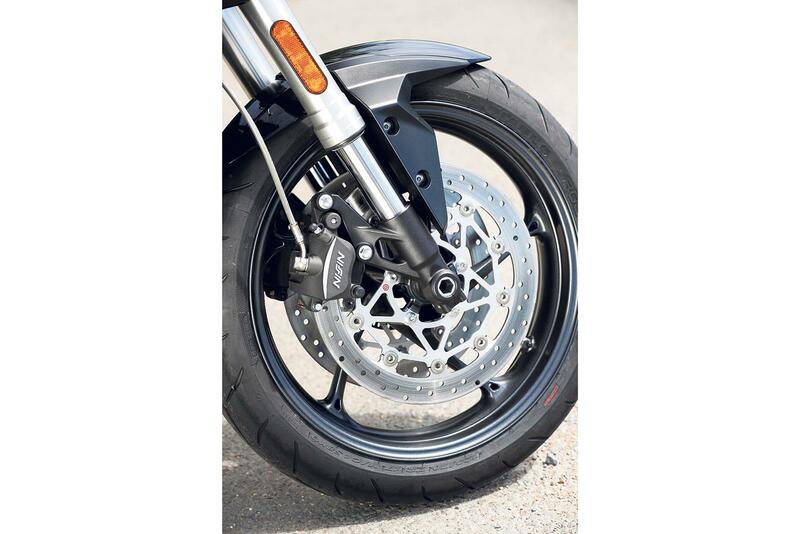 The beating heart of the all three Street Triples is the 765cc motor. It’s a delicious creation, smooth as whipped cream, taking all the bottom end whump and midrange surge of the original 104bhp 675 Street Trip, and layering on even more of both. And while the 111bhp S definitely lacks the top end rush of the 126bhp RS, for general road riding it actually makes the S the better choice. Because the RS has a bad-tempered side; the motor plays nicely up to 7000rpm, then does a Jekyll and Hyde thing, loses its rag completely and becomes a potential handful. It’s not a playful engine, it’s deadly serious. Ride quality is clearly a step below the RS’ Öhlins and a constant low frequency drumming over bumps accompanies a 40mph ride in town. But the edges are rounded off and it doesn’t feel cheap – despite costing considerably less than the RS. As it is, the S will out-nimble Kawasaki’s bigger, more powerful, more expensive Z900, has more character than Suzuki’s cheaper GSX-S750, and is better finished than Yamaha’s loopy MT-09. It also costs significantly less than the RS model, is more accessible and is generally the better choice for general road riding. 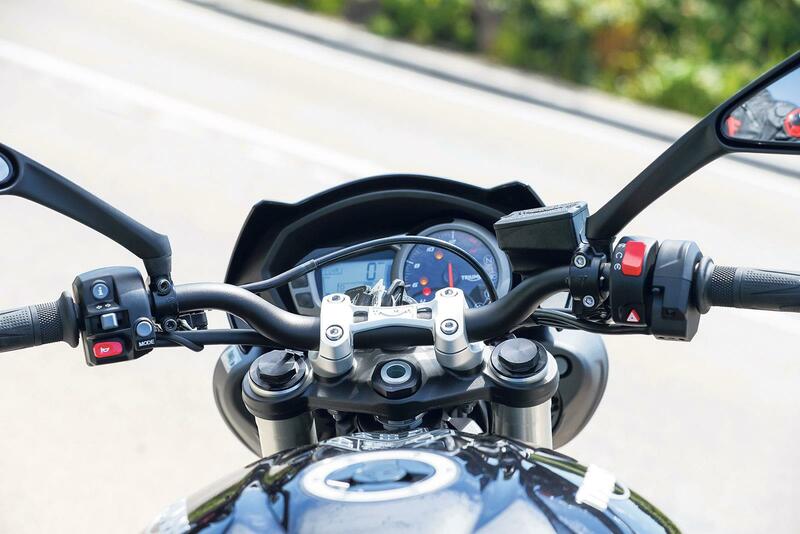 Of the trio of Street Triple models, the S model comes with more basic suspension, non-radial calipers, boring LCD clocks, and only a couple of engine/TC modes. 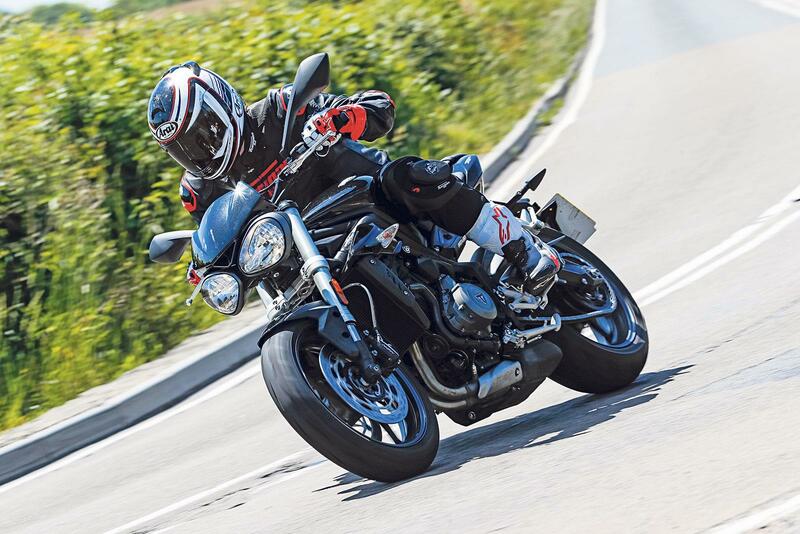 The base-spec, Street Triple, in many ways though, is a more successful package than the RS. 2 owners have reviewed their TRIUMPH STREET TRIPLE 765 S (2017-on) and rated it in a number of areas. Read what they have to say and what they like and dislike about the bike below. 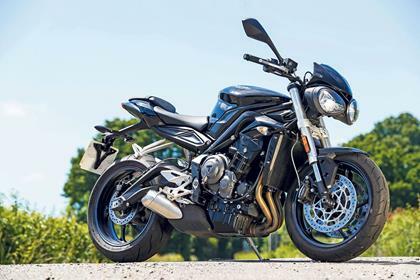 Truly a well balanced and fun naked bike, Triumph have perfected the Street Triple. Stock suspension set up was a bit soft for me (+/- 80 kg) added +1 preload which made a world of difference. Brakes are good, but my previous bike had Brembos which felt a tad sharper, not a major issue but worth mentioning. Seat is comfy and good for all day riding, but the handlebar vibration makes it uncomfortable after a few hours in the saddle. Installing aftermarket bar end weights a plus. Engine has a very playful character and smooth power delivery. Compared to my previous bike (MV Agusta Brutale 675), the Street Triple feels like she has more low end torque. Traction control not really needed as the power delivery is just so smooth, turning it off really makes the bike more fun to ride. Fit and finish are of high quality, and the Triumph triple engine is a proven motor so no major problems expected. First service is at 500 miles, Triumph have a program to pay for the labour for their first service so the customer need only pay for consumables (may not be the case everywhere depending on where you live). Comes with: Two ride modes (Road/Rain), ABS, TC (on and off only), and adjustable preload. Ridden mostly in road mode with TC off as this is the most fun setting and really gives the brilliant engine's full potential. Would recommend bar end weights to reduce vibrations on longer rides and might be worth tweaking the preload depending on your weight and riding style. Exhaust sounds pretty good as stock, but an aftermarket would make it sound great. Bought from Bridge Motorcycles in Exeter, excellent and friendly service. Received a fair trade in value and some extras thrown in. Does everything my 2016 675 did but does it better in every way. Much improved braking and suspension over last years model . Very comfortable . The extra 90 cc's make a world of difference . Only 1000 miles covered but no reason to expect anything to fail. Dealt with Destination Triumph at Washington as always great service and part exchange price.